Mars Hill Music band Citizens, from Seattle, have had one crazy big year. In March they released their debut self-titled album, their single Made Alive has gone crazy on Christian radio, and to top off the year they’ve released a five-track Christmas EP, Repeat the Sounding Joy. It’s a joyous party. I got to sit down for an extensive chat with lead singer Zach Bolen to talk about the Christmas EP track-by-track, challenge him to a duet, and also get an exclusive scoop as to what the band are doing in 2014. SAM: It’s been a few months since we last caught up. We talked about your debut album Citizens then. How have things been since that time? ZACH: Yeah things have been really great. We’ve been encouraged to see all that God’s doing. We’ve had a couple of opportunities to play a couple of places up and down the west coast. It’s been really neat to see just, honestly… two of the biggest things I’ve seen – when we sat down to make that last record, we prayed that the Holy Spirit would allow us to do things we weren’t capable of doing. Which seems like such a normal prayer, because we’re not capable of doing anything that God does. Yet, I think it was just a reminder that this isn’t our work, this is His. And we’re grateful to be part of it. And so it’s been really cool to see stories – we had a girl a couple of weeks ago. We’re playing an event and a girl came up to us and said ‘God used Made Alive to save me!’ I was like, what? That’s crazy! It was cool to hear her describe how listening to that song over and over… she’d been to church a couple of times and certainly heard the gospel preached, but God just used that song to sort of solidify a lot of those foundational truths and really break through and reveal to her – it’s not just a message that just sort of gets received on deaf ears, but you actually have a heart that is totally dead to who God is. And he wants to make you alive in him. So that was cool to hear that testimony. And churches all over the world – it’s been encouraging to hear how the music has impacted their church. It seems like many more conservative churches musically, where busting out a whole band isn’t totally cool, and it’s been neat to hear how they’re playing Amazing Grace or In Tenderness. Though it’s an old hymn people are warming up to it more. Which I think is really neat because – I think music can be really divisive but it can also be really unifying. A lot of churches are seeing that. Other bands are just as much a part of that as we are, but it’s cool to hear nevertheless the stories of our album impacting people in that way. SAM: And from what I’ve seen on social media, Made Alive has just been going bananas on Christian radio over there in the US. ZACH: Yeah it’s been unbelievable. Especially considering the fact that we never – I didn’t even realise that Christian radio was an option! When we were recording the album, for us it was like – what’s going to be the best song to sing at church? I didn’t even realise that they were going to try and push that to Christian radio. It’s been kinda cool considering when they did that the first radio station basically said that it was too vertical. It was too upward. It was too focussed on Jesus. Which sounds horrible that it would even be said. But nevertheless, Jesus wins, and he is breaking into the radio charts and taking it over bit by bit. It’s cool to see it being played on Christian radio here. Just seeing people hearing about Citizens even through that way. And actually getting connected to Mars Hill in that way, that’s a huge thing for us because we’re all about planting churches. It’s cool to see someone in a different part of the States hearing Citizens through radio and connecting to Mars Hill in that way. Who knows, maybe we can build a base that way and go and plant a church wherever they are. SAM: We’re catching up today, but we’re also talking about your Christmas EP Repeat the Sounding Joy. I think it’s absolutely marvellous – I love it. Why did you decide to release Christmas music? ZACH: Y’know – that’s a great question. They basically just asked if me if we’d want to record a Christmas EP. [Laughs] There wasn’t much more to it than that! But I tell you, in the process – and this has always been my thought, and maybe even more so now since we’ve seen what God is doing through the last album and even our EP through the hymns – but seeing how the biggest compliments that we ever get for our music is people saying ‘Man – I’ve never heard hymns done in that way!’ And so as we sat and were thinking through a lot of these Christmas carols… for instance, O Come O Come Emmanuel is one of the oldest songs that any church is singing, let alone Christmas. It’s almost a thousand years old. You look at a song like that and it’s like, wow – ok! Let’s take these songs that people have sung for years, like Hark! The Herald Angels Sing – everybody knows that song whether you go to church or not. SAM: How do you go about writing a new arrangement to these carols that have been around for so long? How do you sit down and write these new arrangements? ZACH: I think this is something that a lot of writers here at Mars Hill – really, we’re Worship Pastors – we don’t want to change the original melody. And if we do, it basically means we’re going to rewrite it as a totally new melody. So a song like In Tenderness, for example. That has a totally different original melody. And Nate Garvey who plays in Citizens just gave it a totally new melody with a lot of the same lyrics. In that case, we’d just call that a hymn re-write. In the case of a lot of the other hymns or carols like Joy to the World, what we didn’t want to do was change the melody. That’s the one thing that everybody knows. So if you start changing with that, you mess with peoples’ minds and you lose them pretty quickly. We wanted to make sure that we’re really strict on that. So every arrangement with the different notes and chords that we’re working on, and the different rhythms and stuff – it has to fit. If it forces us to change the melody a little bit, we won’t do it. If it forces us to change maybe the rhythm of it a little bit, we won’t do it. It’s already been a tested song. People have been singing it for many, many years; so we don’t want to be the ones to come along and change it. So for us, we sit down, take the different components. I usually start with the rhythm, because I feel like that decides a lot of the song – while the chords are really helpful, I want to know ‘Joy to the World, do we want to make this song super triumphant or do we want to make it more contemplative and do a few different twists on it?’ So that’s usually where we start, with a lot of the rhythm, getting some of the basic chords, and then kind of adding stuff in there. These are really fun – especially Joy to the World and Hark! The Herald Angels Sing – they’re obviously joyful songs that talk of the birth of Jesus yet I want them to be like, let’s have a party right now! Let’s actually celebrate the fact that the angels are singing! And there are literally shepherds falling on their faces because they’re beholding the glory of God through these angels who have been sent on this mission to tell them to go and see Christ the King, God Man, Jesus. It’s important that we remember that they are awestruck. They are filled with fear but also celebration. So that’s what we had in mind. So as we were writing that, even the different chords we write with, we want a major chord versus a minor chord. We’re using major chords to help push that celebratory, up vibe that we want with any particular song. SAM: The first track Joy to the World, it is a party, there’s some crazy bass and synths on there. Why did you decide to open the EP with this song? ZACH: Y’know, it’s kinda exactly what I just said. We wanted to be, right off the bat, Jesus is here. It’s really fun and humbling to think about the fact that Jesus has always been king and he left his throne and came to the earth. He humbled himself and became a man. I think that’s an incredible thing. The condescending love of God, that he would leave this place where we couldn’t even totally relate with God. And he makes himself relatable to us by becoming man. I think that in itself is an incredible fulfilment of prophecy and these things that we celebrate now, because we’re 2,000 years removed of Jesus living that life, and dying on the cross and paying the penalty for our sin – we celebrate him coming as God becoming man, but we’re also still celebrating that it’s because of that that we have freedom in Jesus. We’re a church and we’re coming together and celebrating that. And so that’s what Joy to the World is. It’s calling all creation to come together and worship Jesus as the king of all creation. As the king over everything, as the one who has created, those with mouths speak and declare that kind of praise. Joy to the World – you listen to that song and you’re like – alright, this song’s gotta be a party! You just gotta go nuts, and have fun with it. That one was just us sitting down as a band, and Nathan who plays bass did that little bass riff at the beginning, and I was like ‘Dude! We gotta use that somehow!’ We just built it a lot around that, had some fun with it, made the drums go faster, faster, no, get it faster, faster! It was a lot of fun to do that one, and I’ve never sung Joy to the World and clapped to it. I’ve never done that before. I was like ‘we’ve gotta clap to Joy to the World!’ so that’s what we’re going to do this year. Let’s do some clapping, ok? SAM: The EP is called Repeat the Sounding Joy. You’ve been talking about how this EP is a big party, is that why you went with that title? ZACH: Right out of Joy to the World: ‘Repeat the Sounding Joy’ was thinking about the fact that when you think about that statement there’s actually an auditory element: the actual sound of God’s people coming together joyfully. Not just God’s people – all of creation – joyfully proclaiming the King of Kings is here. The Lord of Lords has come from his throne and came to save us. I think that’s – I say this to the band a lot of times… We used to do four services on a Sunday and now we do three. Just over the years shifting some things around at some of our services, but I’m still reminding them ‘Okay if you’re getting bored by this, if there’s something about this becoming really, really bland to you you’re in trouble; because when you get to heaven you’re going to sing these songs 1,000 times over and over and it’s going to be the best thing ever, and it’s gonna keep getting better.’ And so I think that’s the thing about ‘repeat the sounding joy’… Don’t just worship God in this moment for this one thing, continually worship God. Continue repeating, repeating, over and over, the fact that we have joined Jesus. It’s because he’s given us that joy. It’s because he loved us. We now understand how to love him. And we just joyfully throw ourselves into the worship of him as our redeemer. SAM: What are your hopes for this EP other than being a cool soundtrack for family gatherings on Christmas Day? What would you like to see happen with this EP? ZACH: The biggest thing I’d love to see is – OK. It wouldn’t normally be this broad, but it’s going to be for this Christmas EP and here’s why. A couple of years ago I remember sitting and listening to the radio to a Christmas station. And I can’t remember what song it was, maybe O Holy Night or something. And it was a person singing a cover of it, I don’t think they’re Christian based on a lot of other music that they sing. But I was listening to it and was like – it’s crazy that people all over the world are listening to some kind of Christmas music, they enjoy the songs, they don’t love Jesus, they hate the church maybe, they want to have nothing to do with God and the church, and yet they’re listening to these songs that hail Jesus as King and is totally fine with it. It’s just crazy – this is an incredible opportunity to proclaim the gospel, and use this as a really great conversation. So that’s one of my biggest hopes. My hope is that people who just listen to Christmas music every year and something about the way these songs are composed will grab them in a slightly different way. Cos I think that there’s incredible evangelistic opportunities, especially through Christmas music. Everybody listens to it, for the most part. In fact, it makes people very joyful. What I think they don’t realise is the reason why it makes them so joyful is it’s so much – the melodies, it’s what those songs are about. At the core of who we are, we were created in the image of God. We may reject God, we may not know God, but at the core of who we are we were created in the image of God. So at the core being of who we are, we actually in just our very essence, we in some aspects are worshipping God. I think it’s this cool aspect when you take those things, when you take a Christmas song like Silent Night that talks about the birth of Jesus. A non-Christian could hear that song in a different way and I truly believe just the medium, the music, God can use that to emphasise these different lyrics and different aspects, and the Holy Spirit can use those lyrics to lead people and bring people to himself. That’s probably my biggest hope, that there would be a lot of people that don’t know Jesus that by the end of Christmas know Jesus because they hear a lot of Jesus songs on the radio, or a lot of Jesus music through Christmas songs. That there’s something about it, even through our EP that calls them to repentance and to worship Jesus. And on top of that, my hope is that it would be a good resource for the church. We try and make the songs fun but also easy enough that churches can play them. I hope that a lot of churches will find it helpful for them in the Christmas season. SAM: The next party anthem is Hark! The Herald Angels Sing. I’ve gotta say – and I say this in a good way – when I heard the intro, I thought: ’70s cop show. ZACH: [Laughs] Dude, I told you. Cheesy – we wanted to take it back, where are we going? Ok! ’70s cop show! SAM: It’s a very funky track though, what do you love about this carol? ZACH: OK. When we were sitting down looking at Christmas songs, we had another arrangement of Angels We Have Heard on High, and, y’know, obviously there’s the long ‘Gloria’ part that everybody can’t even sing because it’s too long. But then lyrically, that song’s just not even that great. It kind of like takes way too many weird turns, and it cuts corners. And Hark! The Herald Angels Sing is just this amazing, amazing declaration of the shepherds before the angels and this moment where they’re literally on their faces, overwhelmed by this amazing truth that has been spoken, that’s calling them to go and see this king. To go and see this king that has been born. So I think there’s something that’s really profound about that. Again, it’s another party song. It’s a cop show song, I guess. It’s time to go, I don’t know, do something crazy. Maybe you’ll do that when you listen to that song. Maybe you’ll go burn a Christmas tree or something, who knows? It is one of those things where – especially with that song – listening to it, singing the lyrics of it, there’s so much about it that really, really clearly shares the gospel and what it looks like when God entered into humanity. SAM: And is it the Mars Hill Music All-Stars on backing vocals? SAM: How did you narrow a shortlist of Christmas carols to just five for this EP? ZACH: I think when we sat down and started working on it, there were a couple of others we were thinking of doing. What I think is kinda cool about Mars Hill Music is we have other bands that have done Christmas EPs. So last year Kings Kaleidoscope did one. Two years ago The Sing Team released one. So we were looking at these songs and thought – OK – let’s give, especially the faithful followers of Mars Hill Music – let’s give them something new. New arrangements of very familiar songs. So that’s how we picked a lot of those. Last year Kings did O Come All Ye Faithful and a couple of newer Christmas hymns on there too. For us, we just wanted to do something where we weren’t repeating the same thing over and over, but we have churches something more. What we’re about it wanting to build a hymnal of songs that churches can go to, and have different arrangements of different songs they can pool from to help resource their church. So that’s honestly the spirit of it. We picked the five that would be the best for local churches. SAM: Christmas isn’t far away, what do you love about Christmas? ZACH: Oh man… I’ll tell you, being a Dad of two girls now, it’s pretty fun to watch them just go through the season. We watch a lot of Christmas movies. A lot of them. My wife is very much about traditions so she’s trying to look for a new one every single day, leading up to Christmas. It’s getting our Christmas tree before thanksgiving, it’s all these different things. We love the nostalgia and the tradition about it. One of the things that’s been cool with my daughters is we get to every year read through Luke 2, and getting them to hear the story according to Luke of Jesus coming to the earth. I think it’s also fun – I love Christmas Eve and the church coming together, the body of Christ coming together and celebrating that, the eve of the birth of Christ. Who doesn’t love Christmas? I never met anyone who didn’t love Christmas. I’m sure there are people out there and I’ll pray for you. But overall, Christmas is awesome and I’ve nothing but great memories of it and it’s fun to build new memories now with my girls and my wife. We have a son now too, so we’re going to have a party with him too. SAM: Now you’ve written an original song on this EP, and it sits right in the middle – it’s called Come and Stand Amazed. It’s original, isn’t it? ZACH: Well, y’know, that song was actually written by – it’s an old Dutch hymn – that some guy came along and he translated it into English. And then Dustin Kensrue came along and heard the melody a few years back, and was like, this melody is really hard to sing. So he wrote a new melody and we kinda paired together and took the actual musical arrangement and made it what it is as far as the musical composition goes. But I know Dustin especially like, singing those lyrics, it’s not a common song that’s sung. I’d never heard it until he showed me his version of it. So it was like – we need to do this song. Fitting with Hark!… the angels are calling the shepherds to be in awe of God and the fact that he has entered into humanity. And I think it’s the same thing with Come and Stand Amazed. It’s come and stand in awe and just be silent and still before the King of all creation who is in the form of a baby. That’s what’s really humbling about the lyrics of that song. It’s a pretty old Dutch hymn but thank goodness someone could translate that, and Dustin came along and actually wrote a melody to it that’s really easy to sing. I have no doubt that a lot of churches will find it to be really impactful on their worship gatherings. SAM: It has been a big year for you, releasing an album and a Christmas EP. You’re still leading music each week at Mars Hill Church, how have you managed to juggle all of that but at the same time keep the glory going to Jesus? But then I think the way that God just humbles me and reminds me – one is in the community of other worship directors who are constantly calling on one another to repentance and reminding one another of hey – this is the primary calling. But two, another thing that keeps me grounded is… just last week we baptised seven people on a Sunday at one of our services here. We’re witnessing seven miracles right there. And that’s an incredible thing to be part of so it definitely humbles you, and it reminds you that this whole thing that you’re part of is much bigger than you. And while it may from a worldly standard, appear like you may have the recognition or the attention of a lot of people, ultimately what we’re not trying to do is enhance or build on that. What we really want the main thing that people get out of our music is not an identity as a band, but an identity as Christians. We want people to join us in that, and join us in worshipping the creator God. SAM: It’s the end of 2013, what have some of your favourite albums been this year? ZACH: Favourite albums! Ok – The National – their new album, I love it. Went and saw them live a couple of months ago with my wife, it was so great. I really, really love the new Arcade Fire album. Very much so into that one. A lot of people are hating on that album, they think it’s all disco. SAM: I guess it’s got that LCD Soundsystem influence on it. I haven’t heard the whole album but the single Reflektor is pretty disco, in a good way. ZACH: In a good way. But then you get more into it and you realise that’s not the whole… They tapped into the 70s vibe really well. If we did the 70s cop show on Hark! The Herald Angels Sing, they did the 70s Let’s Make a Deal or something like that. They’ve got some game show qualities going on there. SAM: And they got Bowie! ZACH: Dude! I know! Amazing – I love that guy. SAM: Now your EP was recorded a little while ago, how did you get into the Christmas vibe when it wasn’t Christmas time? ZACH: Christmas trees, man. You just go get lots of Christmas trees. And you start listening to lots of Christmas music. In fact, that can be a really good thing but it can also really mess you up. Cos I’m not gonna lie – when we started listening to Christmas music in August, I didn’t want to stop. I kinda went through a down moment for a few days there, I didn’t know if I could give it up. I’m happy to finally have Christmas music back. You just play a lot of Christmas music, you play a lot of clips of Christmas movies on YouTube. And you put up a Christmas tree with lots of lights. You just make it Christmas time. The only thing we didn’t do was fake snow. We talked about turning the studio into an ice rink, which we should definitely do that next year. SAM: I can just imagine you and Dustin Kensrue driving around Seattle with Mariah Carey’s All I Want for Christmas Is You blaring out the speakers, and the windows down. ZACH: Yeah! It’s like that every day, non-stop. SAM: Now last time we talked, we talked about Made Alive. I’d noticed the bongos at the end, which obviously are amazing. You said though, that you were going to put some whistles on that track but you didn’t, and that on the next record you put out, you would. Now I haven’t heard any whistles on this Christmas EP! ZACH: Argggghhh! You’re holding me to that, huh? SAM: I guess this is an EP though, maybe on the next full-length record then? ZACH: Alright, I’m gonna write it down. I’m writing it down right now. Whistles. We’re doing whistles for the next one. No, we need to do whistles man. Whistles need to happen. SAM: But bongoes did make a return on this EP on O Come O Come Emmanuel. I think has to be one of my favourite songs of the year. It is incredible – the groove that you get and the funkiness of it. What’s the story behind this song? ZACH: Again, my only experience with that song growing up was like a Sting version, and I hated it. I dunno – it was just too weird for me. But anyway, last year the band had to put together some Christmas songs for our services and that one just came together in that way. We were on a little bit of a dancey vibe coming out of the – we were in the process of writing for the full length and so that song was kind of fun to pull together for the EP. There’s some weird tension in that song. A lot of the prophecy of – here we are, the Israelites – and we’re in slavery, and we’re enslaved to very oppressive rulers. It’s like O Emmanuel! When are you going to come? When are you going to be here to rescue us from this? There’s that tension, where what we want to do is – a lot of people will stay in that spot on the verses and continue that into the chorus but it’s like – you’re literally saying ‘rejoice’. I just can’t picture in my head saying the word ‘rejoice’ in a very bland, monotone way. And so that’s what we really focussed on. Yes, there is the tension of like, we’re waiting for the saviour to liberate us and bring us out of this enslavement, but we’re also looking ahead to the future and the coming of Christ and we’re saying – rejoice! Rejoice! He has come! He is here. All the prophecy, everything that was foretold, it’s been fulfilled and he’s here. And we need to just throw a big party. And so that’s what we did with that song. We decided to do a little Kurt Franklin action on the back end. SAM: Yeah! It’s almost like you’re rapping at the end – it’s close to rapping! ZACH: I don’t know why [producer] Brian asked me to do that, but I just did it and it kinda happened. [Laughs] We had some fun with that. Basically just taking Isaiah and reading through that, and looking at the passage, just literally reading the passage and the foretelling of Christ. It was fun to be able to take the passage and put a melody to it and literally – just standing at the mic reading the Bible. Reading the passage and just singing. We had a couple of funny takes in there but thankfully, the good one made it. SAM: I’m keen to know what you’ve got in store for 2014? ZACH: Yes, next year… A whole lot actually. I’m really really excited. I can tell you without giving you any dates yet, because I don’t really know. But for sure, we’re going to be releasing a full-length [album]. So we’re really excited about that. A lot more hymns, a couple more originals, maybe even a cover or two of some other existing Mars Hill band songs. So it’s going to be a really, really good album that hopefully again, just serves the church really well. SAM: Well I’m looking forward to hearing that, that’s going to be excellent. We’ll have to have another album chat next year all about it. ZACH: Yes, we will. And if you could brush up a little more on the stylophone and we’ll do it again. SAM: Really? …On the record? ZACH: Ahhhhh… I dunno man [laughs]. Let’s just do it! I can’t make any promises. Y’know, it’s Christmas time, I wanna deliver, but right now let’s just say it’s my gift to you to be part of that. But I don’t know. I don’t know what other people think. SAM: I think I’d rather hear a Citizens album without my stylophone playing on it… The last track on the EP is Silent Night, why did you choose this one to close the EP? ZACH: Mostly just because it’s probably one of the most well-known Christmas songs, and it’s such a beautiful melody. It amazes me when I listen back on some old hymns and old carols. There’s some where the lyric really grabs you, and there’s some songs where the melody is just incredible. I think Silent Night is one of those. It has this – it’s all about Jesus bringing peace in the form of this baby, in the form of this child. He’s brought peace to the earth. There’s something about that melody that brings so much peace to you in that moment. I think we really wanted to do that song for one, but two we wanted to do it in a nostalgic way. I think I was watching Cinderella with my girls, and I was listening to the old operatic singers and I was like – Man! We gotta do something like that on our album. I think it’d be really, really cool, and just even enhance the peacefulness that comes in the lyrics of that song. Hopefully in the music it enhances the truth being sung there. It was a really fun one to take some of those… We actually found a couple of ladies that were opera singers and they came in and they brought it. They brought the pain. It was amazing to have them as part of it, and we’re really excited to release that. Some people will probably be like ‘This doesn’t sound like Citizens!’ and I’ll just say ‘I don’t care!’ because it’s Christmas time. You just gotta make Christmas sound like Christmas. SAM: And you have. It’s been an absolute joy – literally, to go with the EP title – to listen to this EP. I think it’s brilliant music and all the best for next year, and happy Christmas! ZACH: Same to you, Sam. It’s really always – same thing – a joy to talk to you and really grateful for what you’re doing and thanks for having me, man. 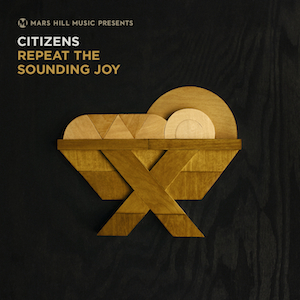 Repeat the Sounding Joy by Citizens is available now on iTunes. Posted in MusicTagged Christian radio, Christmas, Christmas music, Citizens, God, Hark! The Herald Angels Sing, Jesus, Joy to the World, Mars Hill Church, Mars Hill Music, O Come O Come Emmanuel, Repeat the Sounding Joy, Silent Night, Zach BolenBookmark the permalink.